JESSELYN SILVA (above, left) has a nickname: JessZilla. The 12-year-old is a boxer. She lives in New Jersey. After seeing her dad compete, Jesselyn wanted to give the sport a try. She fell in love with it. “I like how boxing keeps me disciplined and focused,” Jesselyn told TIME for Kids. Jesselyn works hard. She trains five days a week, for two to three hours a day. In 2018, she participated in the Junior Olympic Games. Her goal is to win a gold medal at the 2024 Olympics. Jesselyn also wants to motivate other kids to chase their passions. “Don’t be scared to try something new,” she says. QUINCY SYMONDS (above, right) was 4 years old when she first hit the waves. 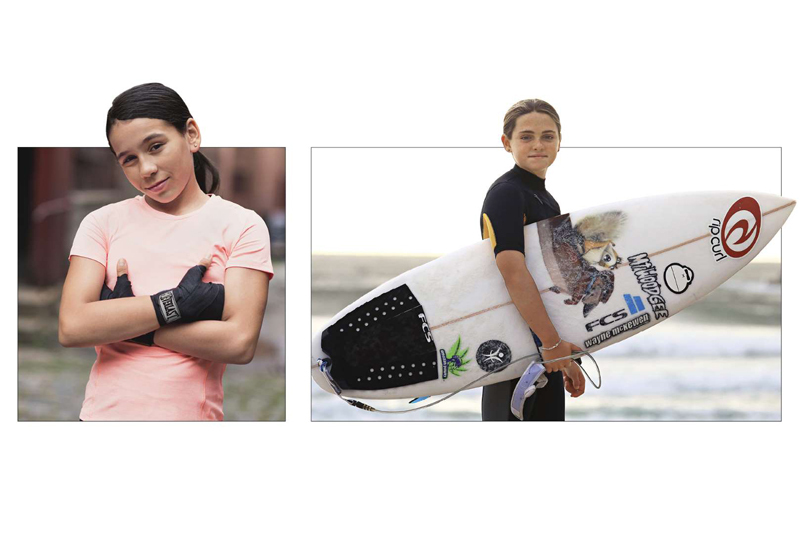 Now 10, Quincy is one of the best young surfers in Australia. People call her the Flying Squirrel. “The ocean gives me lots of energy,” Quincy told TFK. She has big plans for the future. Quincy hopes to become a professional surfer. She also wants to surf Jaws. That’s a spot in Hawaii with huge waves. “Even if you are small, you can still do big things,” she says.